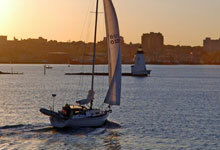 Is your boat properly insured? Understanding your insurance needs, as well as the ins and outs of policy coverage’s, can give you the peace of mind that will let you concentrate on the finer things in life – like getting out on the open water on a clear day for a little well deserved R & R.
Atlass Insurance Group provides insurance coverage for boats and yachts of all sizes, and also provides a comprehensive package of marine and non-marine coverage for marinas, boat dealers, service yards and yacht clubs. It all starts with your choice of an insurance agent, the important link between you and your insurance company. It’s your agent’s job to analyze your coverage needs and to make sure that you have a policy tailored to your particular needs as no two boaters are equally alike. You may want the services of a “marine specialty” agent, especially if you have expanded navigation limits or crew coverage. Specialist agents know the marine insurance business and can help you submit complete and accurate information to the insurance company about your boating experience, vessel and navigation limits. Getting accurate information to the insurance company is crucial, because an insurance policy – as a legal, binding contract between you and the insurance company – can be rendered null and void if any information was concealed or misrepresented. Since your agent may obtain quotations from more than one company, here are some points you may want to consider in evaluating each company’s strengths. Ask your agent if the company employs marine specialty underwriters, who may better understand the intricacies of your situation. For example, if you are planning a trip, will your insurance company be willing to extend your “normal” navigation limits to accommodate you? Do they have the expertise to properly evaluate and provide coverage’s that may be required by some foreign countries? If you have a loss, it could be very important to be insured by a company with marine claims and recovery specialists rather than just standard homeowners/automobile adjusters. At some point, typically when your vessel reaches seven to ten years old, you will need a “condition and valuation survey.” The survey should be out of the water and performed by a SAMS or NAMS Certified Surveyor.